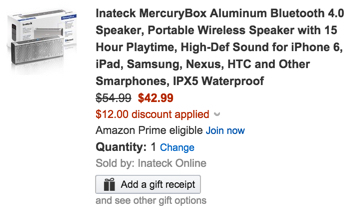 Inateck online via Amazon offers its MercuryBox Aluminum Bluetooth 4.0 Speaker for $54.99. But when you apply the coupon code: PVR6K4CG the price drops to $42.99 shipped. That’s $12 off the regular sale price and the lowest we can find. It has dual 5-watt precision-tuned drivers, it’s water resistant, and has a built-in 1800mAh rechargeable Lithium Ion battery that can last up to 15 hours. We reviewed it favorably, and it’s the #1 New Release in Bluetooth speakers at Amazon where customers gave it 4.3/5 stars. You can also grab from Newegg the URGE Basics Soundbrick Plus Bluetooth speaker with NFC for only $18.99 shipped when you enter the code EMCAVPK62 at checkout (Reg. $24). 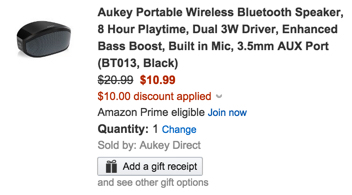 Aukey Direct via Amazon has the Aukey Portable Wireless Bluetooth Speaker for $20.99. When you enter the coupon code: N42HHRUW the price drops to only $10.99 Prime shipped. That’ $10 off the regular sale price and the lowest we’ve seen for it. It has two powerful 3W drivers, a rechargeable lithium battery that can last up to 10 hours, and a 3mm aux connector for non-Bluetooth devices. Amazon customers gave it 4.1/5 stars.